The NFL’s 2014 Preseason schedule is almost underway and NFL Preseason Live is back again this year allowing fans to watch every NFL Preseason Game either live or on demand. UPDATE (August 2015): NFL Preseason Live is now part of the NFL Game Pass Domestic Package. You can order or get more info at NFL.com/gamepass. 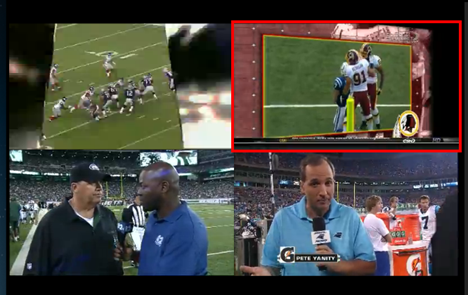 NFL Preseason Live delivers both live streaming and on-demand preseason NFL games right to your computer or tablet devices (through a separate app). NFL Preseason Live appears to pretty much stayed the same as last year, and that’s a good thing. The price point is the same as the last couple seasons with $19.99 getting you access up to September 14th, which is the Sunday of week 2 of the NFL season. Note: This post has been updated for 2014. Here’s the bad news. Just like most online sports products, the games will be blacked out live if they are being broadcast in your area. This blackout includes not only local TV games but any national broadcasts on CBS, Fox, ESPN, or NBC. Every game, however, will be available on demand. Support indicates blacked out games will be available “within 24 hours” while regular games are available immediately after the conclusion of the game. As is previous years, the Preseason Live browser-based viewer is launched in a separate window. A right sidebar, which is easily hidden/displayed, gives you an option of displaying stats and plays. It’s also where you will find the game schedule. Scores can be turned on or off in the lower right corner to prevent and “spoilers.” They appear to be off by default (at least they were for me). Although, this is probably not much of an issue with preseason games since few really care about the score or who actually won. The mosaic view allows you to watch up to 4 games at one time. While in mosaic view, single-click on any one of the videos to enable to audio for that game. It’s also easy to bounce back and forth from the multi-game view to single game view by selecting the single screen from the view panel along the bottom of the viewer window. One of the features that I think is pretty significant one for fantasy football research is the Condensed games that were added last season. The condensed games are essentially the entire game edited down to about 30 minutes. You basically see just the plays, penalty calls, and play reviews while the stuff like walking back to the huddle, unpiling of players after a tackle, etc. are edited out. The interface is very well done and the app includes most of the features you’ll find in the browser version, with the exception of the quad-view. 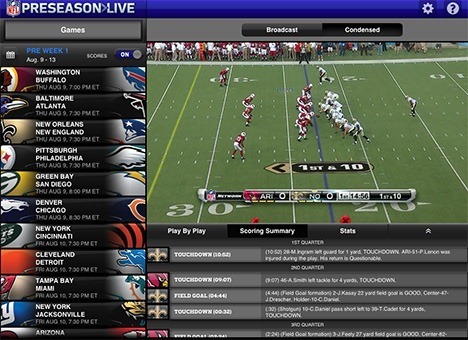 I do a more thorough review of the NFL Preseason Live iPad app here, if you’d like a little more detail. I haven’t, however, reviewed the Android Tablet version. Unfortunately, the app version is only available for iPads and Android Tablets. It is not available for phones and other mobile devices like the iPod Touch. This will be year 4 of subscribing to NFL Preseason Live and the product never fails to disappoint. The video is high quality (determined by available bandwidth) and even looks good streaming on a large screen tv. I’ve believed for years that NFL Preseason Live is a great tool for fantasy footballers. When you get a chance to see with your own eyes the rookies, players returning from injury, and potential breakout players, it really can give you an advantage going into your draft. Also of note, when I logged into NFL Preseason Live on my laptop, it kicked me out on my PC, so it appears that you are restricted to a single logon even on the same IP address. In past years the price of a subscription has been reduced each week of the preseason, but I can’t guarantee that will continue again this year. 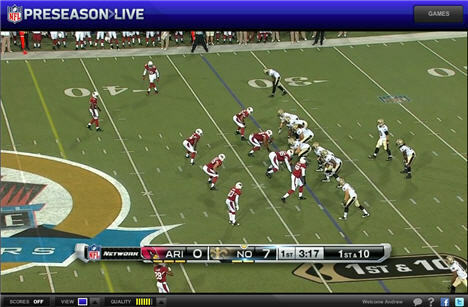 For those of you with iPads, you’ll want to check out our review of the NFL Preseason Live iPad app. You can download the NFL Preseason Live iPad app from the App Store or the NFL Preseason Live Android Tablet app from Google Play. 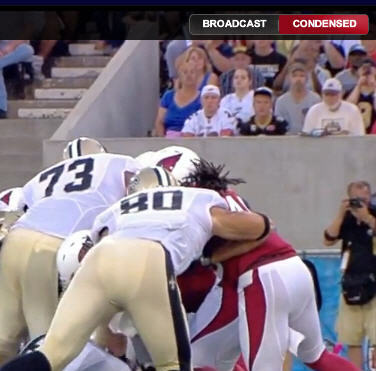 You can subscribe to NFL Preseason Live here at NFL.com. 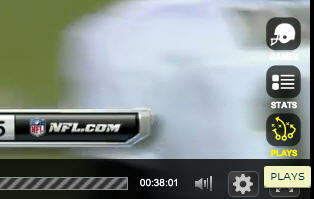 « Will NFL Sunday Ticket Come to PS3 Again in 2012?